This publication is a checklist summarizing information on the parasites of Vietnamese fishes contained in world literature dating from the earliest known record (Billet 1898) to the end of 2003. Information is presented in the form of parasite-host and host-parasite lists and contains 453 named species of parasites. Many records of parasites not identified to species level are also included. 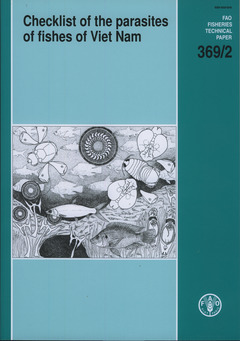 The parasite-host list is organized on a taxonomic basis and provides information for each parasite species on the environment (freshwater, brackish water, marine), the location (site of infection) in or on its host(s), the species of host(s) infected, the known geographic distribution (by administrative division) in Viet Nam and the published sources for each host and locality record. The host-parasite list is organized according to the taxonomy of the hosts, and includes, for each host, the English language and local (Vietnamese) common names, environment (freshwater, brackish water, marine), status in Viet Nam (native or exotic) and information on the known distribution in Viet Nam of the parasites. Both lists are accompanied by remarks and footnotes, as warranted, giving specific information on points of systematics, nomenclature, possible misidentifications, introductions, etc. Citations are included for all references, as well as parasite and host indices.